This small gift is a thoughtful and compassionate expression of your sympathy and concern. 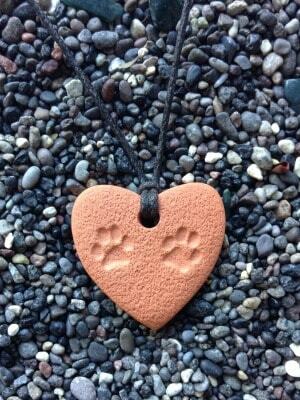 Choose the Puppy Prints or the Kitty Prints Pendant and request the Memorial Poem which will be included at no extra charge! This is an original poem lettered in calligraphy on a parchment card stock. 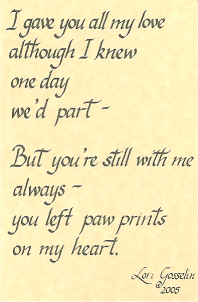 When you purchase a Puppy or Kitty Prints pendant you may have the Memorial Poem at no additional charge! Pendants are only $8.00 each AND when you purchase 20 or more, the price drops to $4.00 each! Simply click on a Pendant photo and add it to the Shopping Cart. When you add the 20th pendant to the Cart, the subtotal automatically changes to the reduced price. After submitting your order, Contact me to let me know you would like to have the Memorial Poem included in your package! P.S. 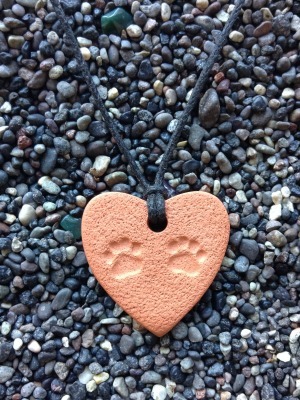 Together with the paw prints pendant, this is the perfect memorial gift from a Veterinary Clinic to someone who has just lost a precious pet. If you have any questions contact us!